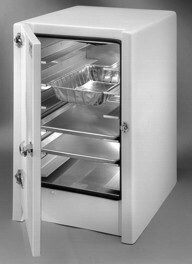 The Insert series is the best investment you can make to guarantee hot food anywhere with economy in mind. Easily installed in vans, station wagons and hatchback vehicles, these inserts maintain the required temperatures of hot meals without the danger of an open flame. Constant temperature of 180°F (80°C) maintained. Designed to make the delivery of small orders more economical. Thermogo Insert Series from Thermogo on Vimeo. Low operating costs, low maintenance and no additional fuel sources needed. Your vehicle becomes a ‘rolling billboard,’ advertising to your future customers while you cater to your present customers. Choose racking options to suit your needs, including sheet pan, hotel pan, stainless flat racks and baskets. Completely customized graphics packages from lettering to full vehicle wraps will enhance your brand and maximize your return on investment. The stainless steel convection holding oven is thermostatically controlled to maintain temperatures in excess of 185°F (85°C). Holds up to 96 meals. Heating is provided by a ceiling-mounted blower system coupled with a series of integrated coils and stainless steel braided hoses, which originate in the vehicle’s existing cooling system.